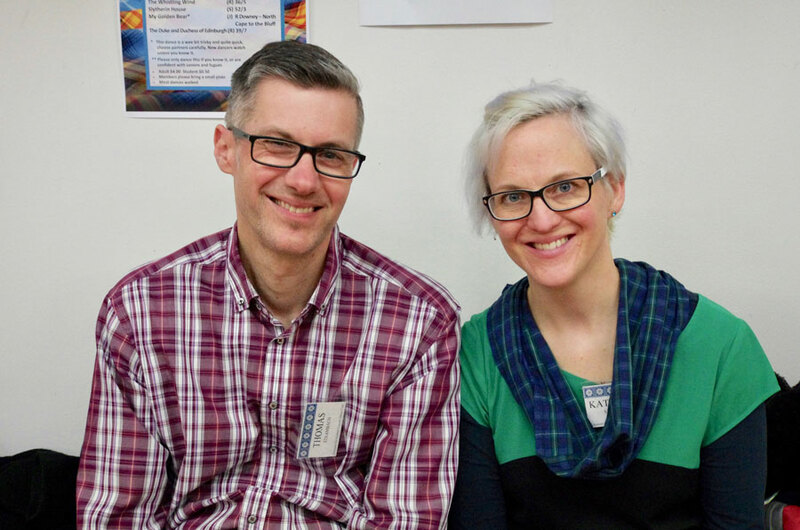 When Austrians Katharina and Thomas moved to New Zealand and settled in Johnsonville, they had no idea they were about to become part of the local Scottish Country Dancing community. Here is their story in their own words. “When we came to Aotearoa / Wellington to stay, there were a lot of things we had expected – nice people, wonderful nature, the sea, silver ferns, green hills, even wind and earthquakes. And then there was the unexpected. One of them is that every Monday, around 7 p.m. we get ready for Scottish Country Dancing. As Austrians who had been living in Vienna for a couple of years, you would expect us to be doing the waltz or maybe some exotic Austrian folk dance like Schuhplattln. But no, we are now Scottish Country dancers. Why Scottish Country Dance? We wanted to do something locally, something fun for ourselves, as well as getting to connect to people. In early 2018 we heard radio ads at a local radio station and read an article in the newspaper, that new dancers are welcome at the Scottish Country Dance club in Johnsonville. Heading for the first night, we were wondering, would this be something for us? Neither of us have any ties to Scotland, nor are we passionate dancers. So we went. And we stayed. What do we like about it? First of all the people – it is a really tight knit but at the same time open community, with people from different backgrounds, different descent, different ages, and all really nice, helpful, and having fun. Then there is dedication. Dedication from our tutor Rod who knows all the nitty-gritty about the dances and the music and the history. Dedication from the whole club team who organise the practice nights and open dance nights. Dedication from all the experienced dancers who help the less experienced. Following the Christmas-New Year break, Katharina and Thomas are looking forward to the start of the 2019 dancing year, getting back in touch with all their dancing friends and welcoming this year’s new dancers in February. You don’t need a partner or a kilt, just a desire to have fun, meet people and dance to toe-tapping Celtic music. Find out more about Johnsonville Scottish Country Dance Club beginners’ classes here or contact Elaine 027 272 5637, or Kristin and Rod 478 4948. This entry was posted in Articles 2019 on January 1, 2019 by admin.